Combinable nested font tags such as <font face=”verdana, arial”><font size=”2”>Hello</font></font>, which could be either rewritten as <font face=”verdana, arial” size=”2”>Hello</font> or, better yet, stripped of font tags so that you can style the page with CSS. Accessibility issues, which identify ways the code can be improved. Missing alt text attributes for any <img> tags. Redundant nested tags that can be safely removed, such as deleting the extra <strong> tags around the words vernal equinox in the following sentence: <strong>Spring begins on the <strong>vernal equinox</strong>, which is usually March 20 in the Northern Hemisphere</strong>. Removable empty tags that are unnecessary and can be deleted from the code, such as a tag pair that surrounds no content (<a href=”monkey.html”></a>) or an opening tag that’s missing its closing tag, as in <p>Hello world. Untitled documents and files with empty <title> tags. Workflow reports for designers working within a group setting. These special reports help identify files that have been checked out by particular teammates, locate files with associated Design Notes, and display files that have been recently modified. From the Site Reports tab in the Results panel, click the green arrow button in the upper-left corner. The Reports dialog box opens. 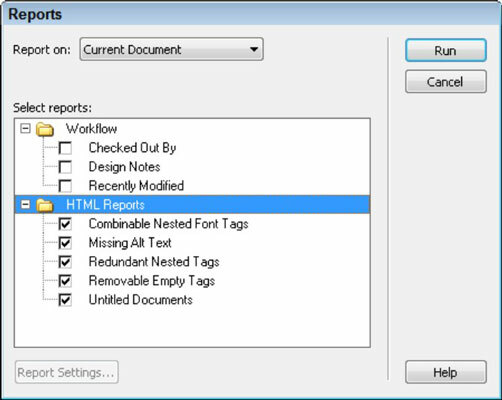 Select each of the options listed in the HTML Reports area of the dialog box. Leave all the Workflow reports options deselected. Click the Run button to run the report. Results are listed at the bottom of the Results panel and are each identified by filename, code line number, and a description. Make corrections directly inside the Results panel or double-click any of the entries to edit directly in the document in question. For instance, one warning might be that a particular image is missing its alt attribute. To fix it, double-click the error and update the HTML code. When you’re finished making corrections, save any changes in the file and then rerun the report with the same settings. Rerunning the report can help you feel confident that all the errors have been addressed.